Following in Todmorden's footsteps, I'd like to form a Google Map showing all Canadians where and how they can get locally produced farm-fresh eggs in Canada. For those who are afraid of the Chicken Police or the Egg Police (the ex-military and ex-police henchmen of the Egg & Chicken Mafia), you may want to fly under the radar, continue to produce in secret for a select few who buy your production. For those who are brave (or foolish) like myself, you can declare to the world your chosen path to produce eggs for your community, come what may. Realize that you will be making it easy for the Health Canada Secret Police and their Provincial/Territorial henchmen to find you and hunt you down when their new regulations come into effect. I have chosen to declare my operation. I think they already have my photo and all other info up on their bulletin board and in their database. I'm actually surprized that this Blog hasn't already prompted them to raid my farm long ago. The form below will allow you to enter your info. Once you click "Submit", your data will be stored in a spreadsheet on a Google Drive. Everybody in the world will be able to see that database of self-declared Small Flock Egg Producers here. The data can be sen in Google Maps by clicking on this link. Each of the small flock egg producers will be a red dot on the map under the tab "Map of Small Flock Eggs". Click on one of the red dots to open up a detailed listing of the data for that small flocker, but the long description of their eggs is not viewable on the map. The "Cards" tab will give a nice, compact view of all data for each small flock farm. Currently, the map updates only by my re-building it manually. I'm trying to get it to be dynamic (rebuilds automatically), but miracles take longer. If you feel we need more info collected about each of the small flockers, let me know. You should be able to update or change your own info later on. If you have a problem, let me know, and I'll try and figure it out (I'm new to Google Docs too). In the form below, it asks you for your Latitude and Longitude, in decimal degree notation. You can get that from Google Maps. Click on the map near where you are located to zoom in. Keep zooming in so you get an accurate placement for people who don't know the local area. Once you can clearly see your exact location on Google Maps, place the cursor over your location and right-click the location, then select What's here?. The coordinates will appear in the search box. Copy those latitude & longitude co-ordinates into the form below. While this is meant for Canadian Small Flockers, I know there are many readers of this Blog from around the world. There is no other system for finding Small Flock Egg Producers, except for Todmorden's map, so anybody else is welcome to use this form and map too. May the customers come and help defend you, and the Egg Police stay away. We have now crossed somewhat of a small milestone at Small Flockers' Blog. This is our 101st Blog posting. We have over 16,000 views from our loyal following. We only need another 8.89 million views to go. At the exponential growth we have been experiencing, it won't be that much longer. Please be sure to pass the word to all your family, friends, co-workers, and neighbours. We cannot survive nor achieve our noble goals if the word of mouth chain stops at just you. Health Canada wants to shut down the small flock and backyard egg producers throughout Canada who provide eggs for their local community. I disagree with both the need, and the methods that Health Canada has used in this misguided witch hunt against small flockers. Is there an alternative to Health Canada's tyrannical plan? which has transformed itself with local food production. Let's take a look at some citizens in Todmorden England. Pam Warhurst spoke at TEDSalon in London UK, May 2012 about their town's initiative for local, sustainable food production, linking local food to the local education system, and local businesses. Incredible Edibles was born. In 5 short years, Todmorden is now considered to be the first town in England that has achieved food self-sufficiency. One of the programs that they launched was "Every Egg Counts", trying to encourage local citizens to raise chickens to provide eggs for themselves, as well as a few of their neighbours. 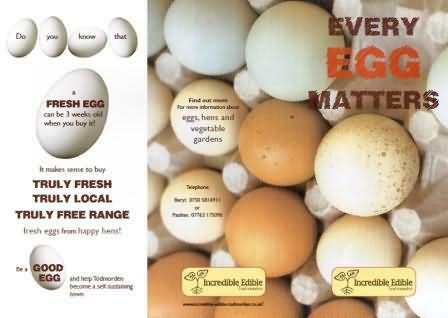 "Truly Fresh, Truly Local, Truly Free Range"
Every Egg Counts was eventually able to convince local farmers that the townspeople were serious, and were truly interested in partnering with the farmers and rural citizens. 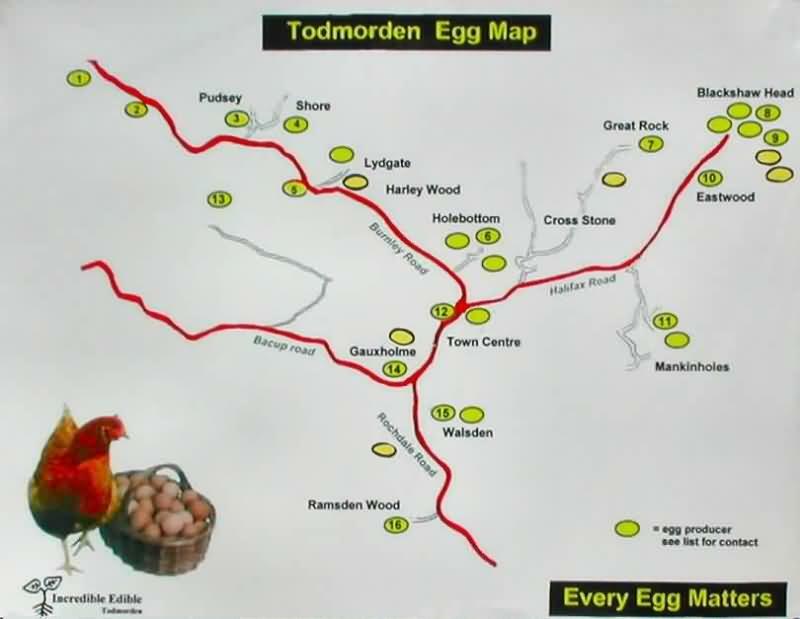 Incredible Edible Todmorden produced a map to show locals and visitors where they could go to get farm fresh eggs. 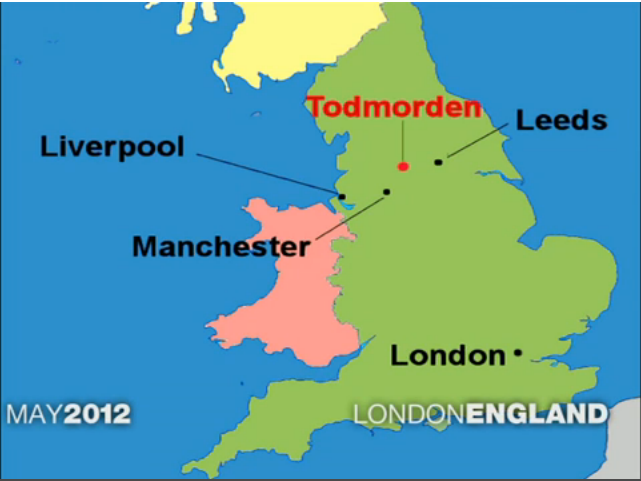 When Todmorden first produced their map, there were only 4 egg producers in the area. Within 3 years, they had 64 local egg producers on their map. People are now going into the local shops seeking to buy local eggs in preference to the mass produced egg shipped in from far, far away. People can rally around food, "If you eat, you're in." 49% of local food producers have reported that their bottom line has improved through Incredible Edibles. Today, there are 49 towns and cities in England who are implementing Incredible Edible, 19 sites in Canada, and hundreds of sites world-wide. Todmorden has graciously shared their success with others so that followers don't have to re-invent the wheel. Congratulations and thank-you to the people of Todmorden for their insight, hard work, courage, and altruism. Do you think that Health Canada should re-consider their unholy alliance with the Egg Mafia? Unfortunately, it doesn't matter what you think. You're not in charge. The Egg Mafia is in charge, and Health Canada is dancing to their tune. Man all battle stations! We're under attack. Without provocation, a surprise attack against Canadian small flockers has been launched, from coast to coast to coast. Unfortunately, this attack has opened battle lines on a second front simultaneous with our ongoing right to grow local, affordable chickens for food. Small flockers have fought bravely against superior enemy forces who have attacked with neither mercy nor just cause. A summary of the enemy's attack on Sept. 9th 2013 can be found here. The diabolical public relations propaganda of the enemy has kept the fully detailed report on their vicious attack secret. However, secret agents of the freedom fighting SFPFC (Small Flock Poultry Farmers of Canada) have infiltrated the enemy's intelligence centre, and like WikiLeaks, SFPFC has posted the full report on the enemy's war crimes. The full report on the enemy's atrocities is posted here for the world to see and witness. "Table eggs from unregulated flocks not complying with the recommendations in this guidance document should not be supplied for the table market, but should be diverted for further processing." By "table eggs", they mean fresh, in the shell, raw eggs sold to consumers. By "unregulated flocks" they mean farm gate (or backyard) sale of eggs by small flock chicken farmers who are currently allowed 99 or less laying chickens in Ontario (limits vary by Province/Territory). By "complying with the recommendations" they mean no more re-using of egg cartons, implementing HACCP (Hazard Analysis Critical Control Point) and passing your annual re-certification audit, implementing Start Clean- Stay Clean and passing your annual re-certification audit, proper egg washing in an approved manner, using (or building your own) a CFIA-approved egg grading station, testing and/or vaccinating against Salmonella, biosecurity separation between meat and egg birds as well as all possible contact with wild animals and birds, collecting eggs multiple times per day, temperature & time control throughout the egg's life, labeling and traceability (forward & backward), lifetime ban from table egg sales for all layers exposed to Salmonella, and many more recommendations. By "diverted for further processing", they mean sending 100% of your egg production for use as animal feed, or bulk eggs that get pasteurized (which sell for less than $0.566 per dozen as NR18), etc. ; not enough $ to recoup the cost of the chicken feed consumed by the layers. How does the enemy try to justify their unjustifiable attack on small flock owners? They try to use a risk assessment, and "advice" from industry experts from the monopolist millionaire egg producers who have quota. Obviously, there is a significant conflict of interest when the quota-based monopolists Chicken Mafia advises Health Canada on the eradication of their competition, the quota-exempt small flock egg producers. There were warning signs dating from Oct. 2011 which happened long before the formation of the small flocker's resistance force, SFPFC (Small Flock Poultry Farmers of Canada). SFPFC's forward scouts alerted SFPFC's command headquarters as soon as these plans and preparations by the enemy combatants were discovered. This plea for help will hopefully alert all friendly forces to our tenuous plight. We pray that reinforcements will soon arrive to aid our cause. To buy time so that SFPFC's reinforcements can get mobilized and into position, a desperate salvo against the attacking barbarians was launched yesterday. Details of this return fire against SFPFC's attackers can be seen here. Hopefully the war mongering aggressors don't realize the current weakness in SFPFC's defenses at this time. Will reinforcements arrive in time, so as to adequately defend us against all subsequent waves of unrelenting attacks that are soon to strike? As your leader of SFPFC's main forces for our ongoing battle for small flock meat birds, I am unable to single handedly defend our interests on both fronts simultaneously (ie. both farm gate/backyard eggs, and poultry meats). Will somebody come to the aid of SFPFC's cause by defending against this sneal attack on our flank? I believe new leaders will spontaneously appear once they see the desperate need, and find the courage to act. If not you as the new leader, then who will you encourage to step up to be a new leader with you as their ready follower? It's always good to be wary of feisty farmers. Is this the beginning of the end for the Chicken Mafia? Due to irresponsible and non-democratic governments, there was the American Revolutionary war in 1776, the French Revolution of 1789–1799, the Haitian Revolution of 1791-1804, the Irish Rebellion of 1798, the independence struggles of Spanish America (1810–1825), Upper Canada Rebellion (1837), and the Chartists in England (1838-1848). The Upper Canada Rebellion was another bunch of feisty farmers, just like at Concord Mass. 62 years earlier. The rebels were soon defeated by the much more powerful government forces, and many were exiled to Tasmania or hung for treason. However, the government of Upper Canada and England were both shocked that their nice, peaceful Canadians would rebel. There is a direct connection in time and circumstance between this 1837 rebellion and the recalling of the Lt. Governor Sir Francis Bond Head in late 1837, the Crown sending Lord Durham as the new Governor-in-Chief in Jan. 1838, with the added mission to also report on the grievances of the people, and his proposed solutions. Lord Durham's report resulted in significant changes to the previously corrupt form of government, and the joining of Upper & Lower Canada in 1840, which in turn eventually leading to the formation of Canada in 1867. It seems each of these irresponsible governments saw themselves as immune, arrogant, and special; that the laws and rights that apply to others don't apply to them. They learned differently soon enough. If the government created the monster that runs rough shod over Canadians today, helping the chosen few at the expense of millions of citizens, shouldn't the government be held accountable for its actions, and tame the monster they created? Today, we have another feisty farmer willing to take on the battle cry. Today it's about the Chicken Mafia, the henchmen of the irresponsible governments of today. 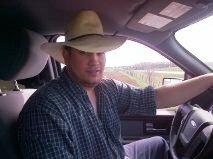 Sean McGivern is a farmer, President of the Practical Farmers of Ontario ("PFO"), and one of the leaders of the Ontario Chicken Rebellion of 2014. PFO has collected thousands of signatures on their petition to reform Ontario's chicken oppression, and free the people. Sean is now ready to do battle with the Chicken Mafia. Sean, the PFO, and many others have asked nicely for responsible government, positive change, and the civil rights for himself and all other Ontario citizens. His pleas have fallen on deaf ears, just like in all of the other rebellions mentioned above. Having no other choice, he has drawn up his battle plan and declared war on CFO, the Ontario Don of the Chicken Mafia. William Lyon MacKenzie (1795 - 1861) was the recognized leader of the Upper Canada Rebellion 176 years ago. Will history remember Sean McGivern as the leader of the Ontario Chicken War of 2014? Time will tell. In a letter Sean sent to CFO on Aug. 14th, 2013 Sean put his cause before the Chicken Mafia, informing them of their illegitimate powers, and Sean's plan to proceed on with what is right. It took CFO only 20 days to respond to Sean's letter, claiming unlimited rights and powers over chicken in Ontario, and warning Sean of the threatened consequences for his refusing to bow to the false god of chicken in Ontario. In 6 days, Sean was back after the CFO to further explain and justify its claimed authority. So far, there has been no response from the Ontario Don of the Chicken Mafia (ie. the CFO). If a response occurs, I hope Sean will share that with everybody as well. Participants in the Upper Canada Rebellion of 1837 paid a very stiff price. Michael Schmidt has had a similar battle with the government over raw milk, and paid a high price for his rebellion against the rights of adults to choose raw milk for themselves, and his right to produce it for them. Will Sean suffer a similar fate as other leaders of rebellions against irresponsible and non-democratic governments? Will there be others who choose to follow Sean's lead? Who is the gouger, and who is the gougee for Canadian chicken? Chicken Farmers of Canada supplies market data in their monthly Chicken Fax issued Sept. 6, 2013 that may help answer this question. The two graphs on the right were extracted from there. 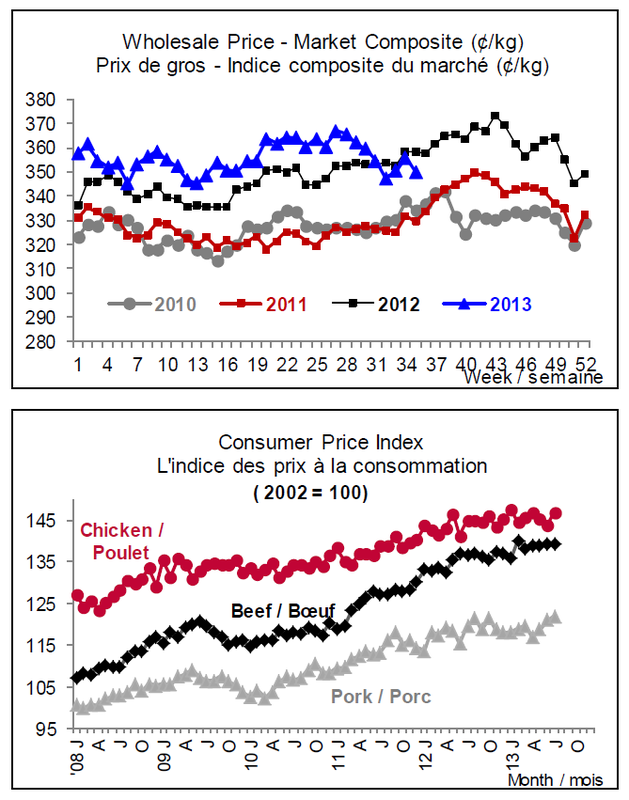 The top graph shows remarkable stability in wholesale prices for chicken during a 4 year period (2010 to 2013). Wholesale prices occur between the slaughter plants and the grocery stores. 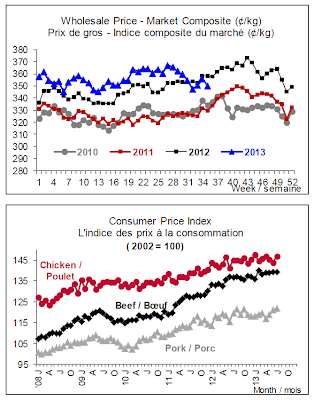 The bottom graph shows the Consumer Price Index for chicken, beef, and pork from Jan. 2008 to August 2013. Here we see an almost constant upward trend in chicken prices. Over this 43 month period, retail chicken prices went up at an average inflation rate of 2.68% per year. Meanwhile, wholesale prices are virtually flat, constant, always the same, more or less. Note that it isn't just chicken, for beef and pork are up to the same tricks. I'm not sure who is leading the dance, but they're all jiving to the same tune. This graph shows the life chicken price paid at the farm gate. There have been steady price increases, plus seasonal variations. Most of the price increases were related to the increasing chicken feed prices that the Chicken Mafia fraudulently inflated even more so they could get additional unjust profits. See Blog posting here where Ontario's government forced the Ontario wing of the Chicken Mafia to roll back the bogus FCR charges they had been making for the last 10 years; a cool $136.59 million per year previously being stolen by the Ontario branch of the Chicken Mafia. There has been a knock down, drag out fight between chicken farmers and chicken processors over the quantity and price of chicken for a very long time. The processors have complained the chicken farmers are protected by a guaranteed price minimum, while the producer takes all the risk on getting a price that is profitable and selling all the chicken before it goes rotten. On this battle between chicken producers and processors, I have received a CD full of documents from the Federal Farm Products Council based on a Access to Information Act request. More on these juicy disclosures as soon as I finish reading all 692 pages. As bad as the farmers have been, the tail-end of the Chicken Mafia (ie. the retail vendors & grocery stores) aren't much better. I therefore conclude that the chicken farmers have been gouging the public for at least 10 years. The retail grocery stores are now taking their turn at gouging the public between 2010 to 2013. It warms my heart when everybody plays together nicely and take turns. It's good that both gougers share and take turns screwing the public. The nerve of CFC (Chicken Farmers of Canada)! Barrie McKenna at the Globe & Mail saw my Blog and did an article on it in their national paper. Barrie contacted both Chicken Farmers of Ontario ("CFO") and CFC to get their comments. CFO refused to discuss the $10 Billion stolen from Canadians by the Chicken Mafia. Is that their arrogance showing? CFC's Executive Director Mike Dungate disputed my $10 Billion figure, and rejected my claim that the Chicken Mafia have been grossly overcharging for a decade. OK, so if CFC disagrees with my calculations and assumptions, then where are their calculations and a list of their assumptions? To dismiss & reject our estimate without providing an alternative is pure, 100% arrogance by Mr. Dungate, and CFC (the Canada-wide Don of the Chicken Mafia). "The net impact ... would be “cents” per kilogram at the grocery store." Where do these guys get off? In a previous Blog post, I showed how the Chicken Mafia stole $10 Billion from the Canadian consumers with illegal and immoral chicken prices obtained by cheating on the FCR (Feed Conversion Ratio) that producers get reimbursed for. And you thought the phony expense claims by Senators was insulting to Canadians. Compared to the Chicken Mafia, the Canadian Senators are Jr. Kindergarten pupils in wet, stinky diapers. I concluded that when the Ontario Government ordered the Chicken Mafia Don (ie. CFO) to drop their FCR by 16.3%, this should translate into a 7.21% drop in retail price of chicken at your friendly grocery store. That assumes that everybody else in the chicken supply chain can resist grabbing the savings for themselves as added profit, before it can get to the consumers. Fat chance on that! So is CFC's Mike Dungate right? Will it be just "cents", and not worth worrying about? Statistics Canada reports via Agriculture & Agri-Foods Canada in Table 031N that Ontario's retail price for fresh whole chicken from Dec. 16/2012 to July 27.2013 was $5.75/kg. With a 7.21% drop at retail, that would save consumers $0.4145/kg. So Mr. Dungate is correct, it is "just cents". What Mr. Dungate has done is mis-lead and dismiss, a common ploy by the Chicken Mafia. In CFO's 2012 annual report they say that 195 million chickens were raised in Ontario by the Chicken Mafia in 2012, and that was a total of 447 million kg. of live chicken, for an average bird weight of 2.292 kg. Since the eviscerated weight is 73.72% of the live weight, those CFO numbers equate to 329.53 million kg of eviscerated chicken at the grocery store meat counter. When you take $0.4145/kg price reduction times the 329.53 million kg of eviscerated meat produced, that is an aggregate total of $136.59 million per year previously stolen by the Ontario branch of the Chicken Mafia. $136.59 Million per year, proceeds of crime for the Ontario Chicken Mafia. We're surrounded by contaminated chicken, and may need to surrender. Nobody thinks they will fall victim to food poisoning, until it's too late. Studies have shown that 30% to 80% of the chicken sold at retail are significantly contaminated by E. Coli, Salmonella, Campylobacter, Listeria, and/or other human pathogen. How could this be allowed to happen? Why have we allowed it to continue, so that contaminated chicken has now become the new "standard of quality" ? "All health and safety standards under the Food and Drug Regulations are enforced by the Canadian Food Inspection Agency. The Agency is also responsible for the administration of non-health and safety regulations concerning food packaging, labelling and advertising." I therefore have some burning questions for government authorities about the risky and ridiculous situation they have allowed Canadians to be preyed upon by the Chicken Mafia. They condemn and prohibit small flock farmers from processing their fowl at their farm gate, yet allow the current system to run amock. If that isn't bad enough, CFIA has plans for allowing unlimited chicken slaughter plant line speeds. Some of these chicken abattoirs now run at over 200 birds per minute. That gives the CFIA Inspector just 0.3 seconds per bird to inspect (ie. 3 birds per second whizzing by the CFIA Inspector), haplessly and hopelessly trying to ensure the birds are healthy and not contaminated. I have worked as a Quality Assurance Manager and a consultant in high volume automotive parts manufacturing plants and electronic circuit board manufacturing plants that used similar line speeds. I tested our quality inspectors to see what they could consistently achieve at those speeds. Generally, the inspector was mentally fatigued and no longer effective after 10 minutes to 2 hours on-the-job; depending on the individual inspector, lighting, number of possible defects, defect rates, and ambient conditions. To ensure consistent quality, we had to build it in at source (ie. prevent the defect from occurring, so it doesn't need to be inspected for later), and relieve (or rotate) the inspectors faster than their capabilities deteriorated. Has CFIA done similar, statistically valid tests for all of their Inspectors and determined their proven capabilities? If not, why not? Hint to CFIA: Conduct an R&R (Repeatability & Reproducibility) Study, long method (3 Inspectors, 3 trials, 10 samples= 90 measurements), or some other statistically valid AOQL (Average Outgoing Quality Level) inspection plan. Prove to Canadians that CFIA can consistently achieve less than 10% R&R error at the line speeds and environmental conditions each CFIA Inspector is forced to work under. If you are unwilling or unable to do so, feel free to submit your resignation so as to make room for somebody who can and will. How many people have to be killed or made seriously ill (perhaps with effects lasting decades, if not forever) by contaminated chicken before Health Canada, CFIA, and provincial governments will rein in the Chicken Mafia? To get answers, I have sent an email to the CFIA and a few MP's and MPP's. We will have to wait until they respond to get the important answers Canadians need and deserve. Until we get answers and solutions, you will need to keep yourself and your family safe. Here are a few tips. Studies have shown that the outer surface of raw chicken wrapper film is likely to be contaminated too. Therefore, at the grocery store meat counter, get a new plastic bag from the store's meat counter (or fresh vegetables Dept. ), open it up, put it over your hand as a glove, then grab hold of the packaged chicken with your bagged hand. Carefully turn the bag inside-out over the chicken, tie the bag, and place it in your grocery cart at the opposite end of the cart, well away from ready-to-eat foods and those eaten raw. you use to transport raw chicken. If you use permanent grocery bags when you go shopping, get one that is a totally different colour (or mark a bag so it is obvious), and use it to carry for all radioactive and/or contaminated foods that you buy (eg. raw chicken). That way, you minimize cross-contamination potential between chicken and raw vegetables, or between this shopping trip and the next one. When you get home and want to refrigerate your prized chicken, keep the chicken double wrapped, yet assume it will leak, so watch out below because the fresh veggies are usually at the bottom of the fridge in harm's way (who designed fridges with fresh veggies in a crisper at the bottom of the fridge ???). Placing the chicken in a bowl may be a better idea. Check the grocery bag for leaks, and if found, launder or throw it out. Remember, DO NOT WASH your raw chicken carcass after you take it out of its plastic bag. Studies have found that the micro-drops splashed from the chicken can have sufficient contamination to make someone sick, and the splashing can travel up to 5 ft. radius from the sink; contaminating counter tops, cutting boards, and any foodstuffs sitting there. If you can't bear the idea of cooking your bird complete with all the ooze you paid for at the store, go ahead and rinse the chicken, but be sure to do a major decontamination of your kitchen. See HAZMAT suit below. When you want to cook the chicken, find a counter that you can readily disinfect after you are done. Carefully grab the chicken out of the refrigerated bowl by the outer bag and hold it over the roasting pan. Undo the outer bag, and use scissors to cut open the inner bag, then place the used scissors into the chicken bowl. Slowly and carefully, allow the chicken to slide out of the bag into the roasting pan. Place the bags into the chicken bowl for drip-free transport to the garbage. Throw out all plastic bags so they cannot be re-used nor touched by some unsuspecting person who could be subsequently contaminated (even somebody pushing down on the garbage to create more room, or placing something else into the garbage). Use soap and water to wash and rinse your hands and arms (most contamination potential), then all the counters and surfaces near where you were working. You may want to use a disinfectant as well. Check the fridge for drips, and wash the shelf when the chicken sat. Rinse the bowl carefully. Most household hot water systems operate at 60°C or cooler, so it won't kill Salmonella or other pathogens at that temperature, so you may want to use the electric heat cycle on a dishwasher to be sure. For those who are somewhat accident prone or afraid, you may want to invest in a HAZMAT suit to protect you from your raw chicken. Once the chicken thermometer reads 71°C, you can get out of your HAZMAT suit and get ready to eat some delicious Canadian chicken, courtesy of the Chicken Mafia. If you can consistently do all the above, then congratulations. You are now fully qualified to handle contaminated Canadian chicken, and/or handle spent nuclear fuel rods at your friendly neighbourhood nuclear power plant. Be sure to put that on your resume. Ontario residents want to know exactly when we get cheaper chicken. On July 11, 2013, Ontario's Farm Products Marketing Commission ("FPMC") ordered Chicken Farmers of Ontario ("CFO") to drop the feed conversion ratio ("FCR") price adjustment factor by 16.3%. CFO has been using this bogus FCR to screw the Ontario consumer for the better part of 10 years. I've been getting phone calls, email, and conversations in person. Even the Globe & Mail has expressed an interest. My best estimate is: Never! Think about crude oil and fuel (gasoline, diesel, home heating oil, etc.). When there is a spike in crude oil prices, ever liter of fuel almost instantly gets upwardly re-priced at the new crude price plus the cost to change it from crude to gasoline or diesel. If there is a sudden drop in crude oil prices, it takes forever (or at least 3 to 6 months) for the first penny to slowly work its way towards the consumer. The consumer has to fight and competitively shop for each and every penny drop in retail prices. Should we expect anything different here? When CFO vacates 16.3% on the FCR, that should create a 9.78% drop in the minimum price of chicken. Realize that is the minimum legal price. 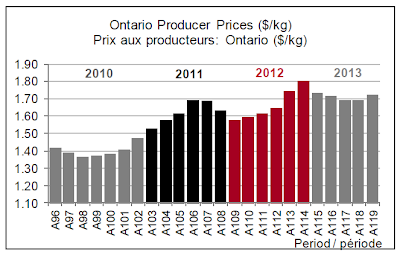 Chicken producers could always charge more, and perhaps that is just what they will do, all 1,114 of them in Ontario. In that case, there is nothing to hope for. However, members of Ontario Independent Poultry Processors Association ("OIPPA") and Association of Ontario Chicken Processors ("AOCP") may have some bargaining power with the factory chicken producers. They may be able to use this and some hard bargaining to get a lower price of chicken. If they do this, there may be hope. However, there are further processors for chicken that process it after the slaughter plant. That could be breaded chicken fingers, TV dinners, ground chicken, and many other variations. Ontario Independent Poultry Processors Association ("OIPPA") has some of these further processors as members. Ontario has about 65 per cent of Canada’s further processors. In addition, there are brokers, distributors, and wholesalers; all of whom would like to become (or stay) millionaires. That means they will try to grab some or all of the vacuum created by CFO's correction in their bogus FCR pricing. Finally, some retail stores have been using "cheap" chicken as a loss leader to attract customers. These large grocery chains may use this lower cost chicken to raise their profits, changing chicken from a loss leader to a profit centre. If all of these steps in the chicken chain from chicken factory to retail meat counter get a pang of conscience, or are asleep at the switch, there is hope that the consumer will see a price reduction. The new pricing starts in Chicken Quota Period A-120 (Oct. 6 to Nov. 30). At current consumption rates, there is usually 1 to 3 months supply of fresh and/or frozen birds in the system (depending on cut, grade, geography, and supply chain). Since the Chicken Mafia want to delay the introduction of cheaper chicken as long as possible, we will assume a FIFO (First In, First Out) inventory system so that profits and product freshness are both maximized. We can therefore hope for reduced chicken prices starting as early as the slim chance of Dec. 1, 2013 to the possibility of Feb. 1, 2014, or most likely never. However, there is hope. Consumer expectation is everything. If EVERYBODY knows and expects a reasonable and timely drop in chicken prices, that expectation could carry the day. If everybody tells there butcher, meat counter re-stocking student worker, or grocery store managers about this bogus FCR, the 16.3% reduction, and their expectation to see it as a retail price reduction of 7.21% at the retail meat counter. If we all start our lower chicken price expectation marketing today, we just might get an early Christmas present at the meat counter.